This eastern North American Lactarius is found in oak-dominated forests and looks, on casual inspection, like several other white species in the genus. However, careful observation of the gills (which are very crowded), the milk (which is white and does not turn olive to pastel green when it dries), and the cap surface (which does not break up into scaly areas) will eliminate most look-alikes. As its name suggests, the taste of this species is peppery--excruciatingly so; you are not likely to test it more than once. In the oak-hickory forests of the Midwest, where I do much of my mushroom collecting, Lactarius piperatus is not as frequently found as Lactarius glaucescens, which is nearly identical but features milk that dries green. Lactarius piperatus is actually a European species, first named by Linnaeus in 1753. It is unlikely that our North American species is actually the same--and there may be several phylogenetically distinct species hanging out in "Lactarius piperatus" as I have described it here. Ecology: Mycorrhizal with oaks and other hardwoods; growing scattered, gregariously, or sometimes in dense troops; summer; apparently widely distributed east of the Rocky Mountains. Cap: 4-15 cm; broadly convex, becoming flat, shallowly depressed, or vase-shaped; dry; the margin even; bald; white or whitish, sometimes discoloring a little yellowish or brownish with age. 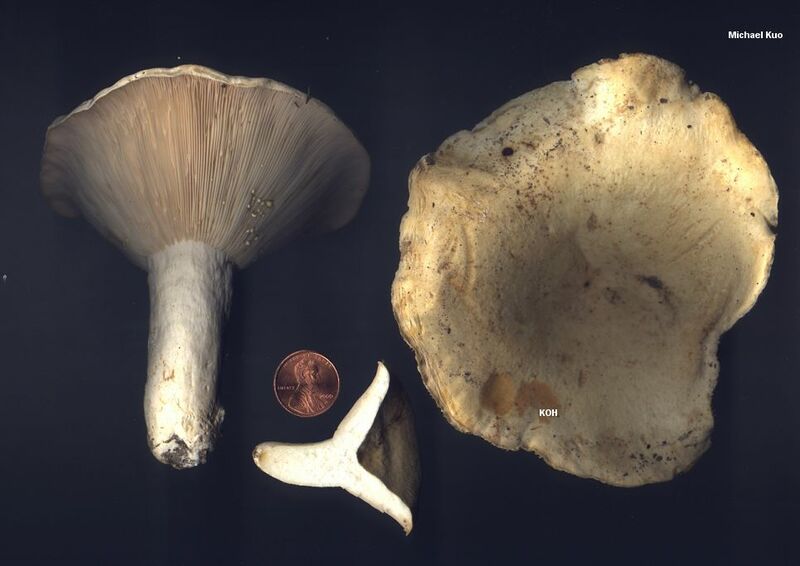 Gills: Attached to the stem or running slightly down it; very crowded; forking frequently; white becoming pale cream. Stem: 2-8 cm long; 1-2.5 cm thick; white; more or less equal, or tapering a little to base; bald; without potholes; solid. Flesh: White; thick; hard; sometimes discoloring yellowish with age. Milk: Copious; white; unchanging after exposure, or changing slowly to yellowish; not staining tissues, or staining them slightly yellowish; not staining white paper. Odor and Taste: Odor not distinctive; taste excruciatingly acrid. Chemical Reactions: KOH pale magenta on cap surface. 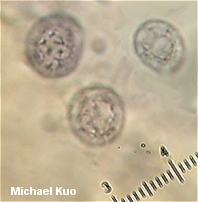 Microscopic Features: Spores 5-10 x 5-8 µ; broadly ellipsoid; ornamentation less than 0.5 µ high, as scattered warts and lines that occasionally form vague patterns but do not form reticula. 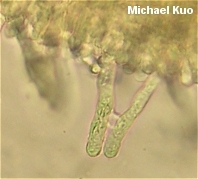 Pleuromacrocystidia up to about 70 µ long; subcylindric. Cheilocystidia similar. 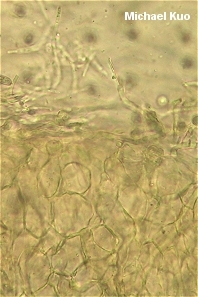 Pileipellis a hyphoepithelium with the upper, cutis-like layer very thin and the lower, cellular layer easily demonstrated. REFERENCES: (Linnaeus, 1753) Persoon, 1797. (Saccardo, 1887; Kauffman, 1918; Hesler & Smith, 1979; Smith, Smith & Weber, 1979; Weber & Smith, 1985; Arora, 1986; Phillips, 1991/2005; Lincoff, 1992; Heilmann-Clausen et al., 1998; Barron, 1999; Miller & Miller, 2006; Binion et al., 2008.) Herb. Kuo 07079701, 08270216, 07010805.